Recaptains to the rescue! I forget where I originally heard about the Recaptains. (If it was you who told me about them, please let me know. I have a feeling it may have been via Maggie Stiefvater, who wrote the recap for her own book, The Raven Boys.) The Recaptains, as the name suggests, write recaps – not reviews – of series books, including spoilers to help those who read the first book(s) but want a refresher before starting the next in the series. If you, too, are waiting for a copy of Allegiant, here are the recaps of Divergent and Insurgent. They aren’t perfect, but they serve their purpose. 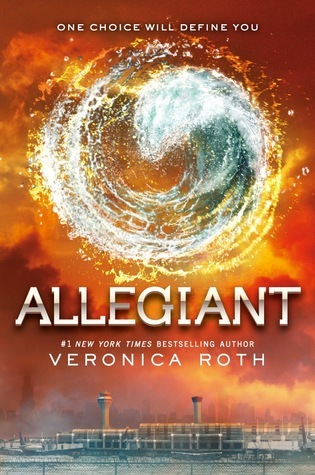 And if you’ve read them both but still aren’t sure about continuing on with the final book, the FYA review of Allegiant is pretty safe (no major spoilers). For my 201st (!) post on this blog, I’m going to take the unprecedented step of writing about a TV show (well, mini-series) instead of a book. 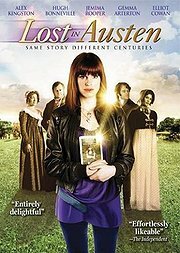 On a co-worker’s recommendation, I checked out Lost in Austen, a British (ITV) miniseries from 2008. The premise: Amanda Price is a modern-day young British woman with what seems to be a rather boring job and a less-than-romantic boyfriend; Amanda finds romance in the pages of Pride & Prejudice instead. Right after her boyfriend proposes (about as un-romantically as possible, while still being sincere), Amanda discovers Elizabeth Bennet in her bathroom. Lizzie has entered through a door that used to go nowhere, but now is a portal (sometimes) between Amanda’s bathroom and the attic of Longbourn, the Bennets’ house, right when Pride & Prejudice is about to begin. Lizzie, entranced with the electric light in the bathroom, desires to stay; Amanda goes through the little door/portal, it shuts behind her, and voila: the two have changed places. From this point on – until nearly the end of the miniseries – the viewer stays with Amanda in P&P, with no idea what Lizzie’s up to in present-day London. This is a significant choice, as most switcheroo stories go back and forth about equally between the two characters. However, Lost in Austen focuses on Amanda (“Miss Price”) as she royally screws up how the story is supposed to go, despite her best efforts to make everything happen the way it does in the book. If I were Amanda, as soon as I realized where/when I was, I would endeavor to obtain some period clothes ASAP. Instead, she blunders around wearing a leather jacket, a vivid purple top with studs, pants, boots, jewelry, and makeup. Eventually she does start wearing some of Lizzie’s clothes, but she rejects one of the Bennet sisters’ (Jane or Lydia, I forget which) offers to do her hair, and she continues to wear makeup (did she have a kit with her?). At one point, Lizzie slides a letter under the still-locked portal/door, which Amanda brings to Mr. Bennet. (Amanda and Lizzie have concocted some story that Lizzie went to stay at Amanda’s place in Hammersmith, while Amanda came to visit Longbourn, chalking this up to a cute miscommunication.) However, it never seems to occur to Amanda that she might be able to communicate with Lizzie the same way (i.e. letter-under-the-door), even though she’s desperate for her to come back and fix the story. Late in the series, Amanda gets fed up and rips up her beloved paperback copy of P&P, scattering the pages all over Pemberley. Darcy finds them and accuses her of being the author, despite the fact that he can’t possibly have failed to notice the difference between that book (its paper quality and its type, even if he didn’t see the page with the cataloging-in-publication information) and contemporary (to him) books. Finally, despite all of the changes from the original story, Austen’s text doesn’t change to reflect it. This would seem to violate one of the rules of time travel in literature, but because the Bennets et al. were supposed to be fictional to begin with, maybe that’s the loophole. 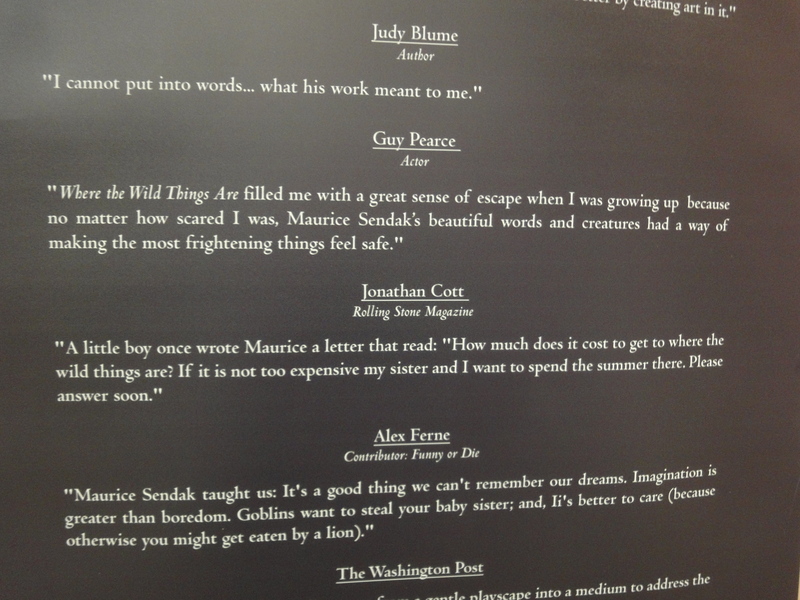 Regardless, P&P still features Elizabeth, not Amanda. According to IMDB and Rotten Tomatoes, Lost in Austen got about 70% approval from viewers, which isn’t bad. Forever Young Adult liked it more than I did too (see here and here), so perhaps it was just really that Amanda’s bangs (“fringe,” if we’re being British) and constant reapplication of lip gloss irked me. All in all it was okay, but for a real Austen fix I’d just go back to the BBC miniseries, or even the 2005 movie adaptation. Hugh Bonneville makes a good Mr. Bennet, though. 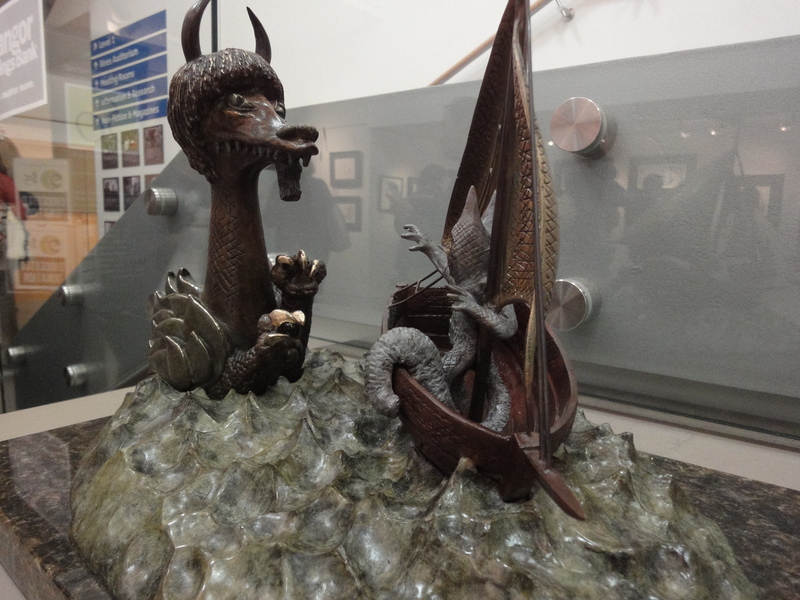 In addition to all of the great material on the NELA conference blog recapping various sessions, my colleague Linda posted a rundown of the sessions she attended, and of course the Swiss Army Librarian wrote a recap as well (he also contributed to the conference blog). Both Linda and Brian’s posts are concise and informative. The links above mostly go to one of my or Brian’s recaps on the conference blog, or to the description of the session on the official conference site (which in many cases include links to the presenters’ materials, such as slides or handouts). I noticed no one had written about Laura Saunders’ presentation, so my recap of that is below (also cross-posted to the conference blog). No one had covered Melora Norman’s session either, so I wrote a brief post about that on the conference blog as well (see link above). I think that will be all for my NELA posts, but I can’t guarantee it…I may need to write about ebooks some more, because Jo Budler was awesome. The ACRL defines information literacy as “a set of abilities requiring individuals to “recognize when information is needed and have the ability to locate, evaluate, and use effectively the needed information.” Though the term “information literacy” itself is somewhat problematic and can be off-putting to some, most faculty recognize its importance. Despite the agreement about the importance of IL, many college students are not as prepared as faculty would like. The library fits into the larger mission of the university, providing an opportunity for collaboration in this area. However, the reality is that most IL instruction is covered in “one-shot” classes or within General Education (GE) requirements; there is a lack of assessment, a lack of time devoted to it, and a lack of faculty buy-in (they agree that students should have the skills, but aren’t so sure it’s their responsibility to teach them). Who is responsible for doing what? Where does the library fit into curricular support? Though IL instruction is often covered in GEs, Saunders suggested it might be more useful to move it into the individual academic disciplines. There are “cultures within cultures,” she found when she surveyed faculty, asking, “Do you think information literacy is different in your discipline?” Common concerns include searching for and evaluating information sources, but different kinds of information are preferred in each field (primary vs. secondary sources, for example). Most IL instruction sessions, however, are structured the same way: most of the time is spent on finding sources, not evaluating them. In an oft-retweeted phrase, “The role of the librarian is to turn students into skeptics.” Often, though, students aren’t skeptical enough. In the words of one faculty member from Saunders’ survey, “The idea of digital natives is such a lie.” Indeed, Project Information Literacy (PIL) has found that students value convenience over quality. 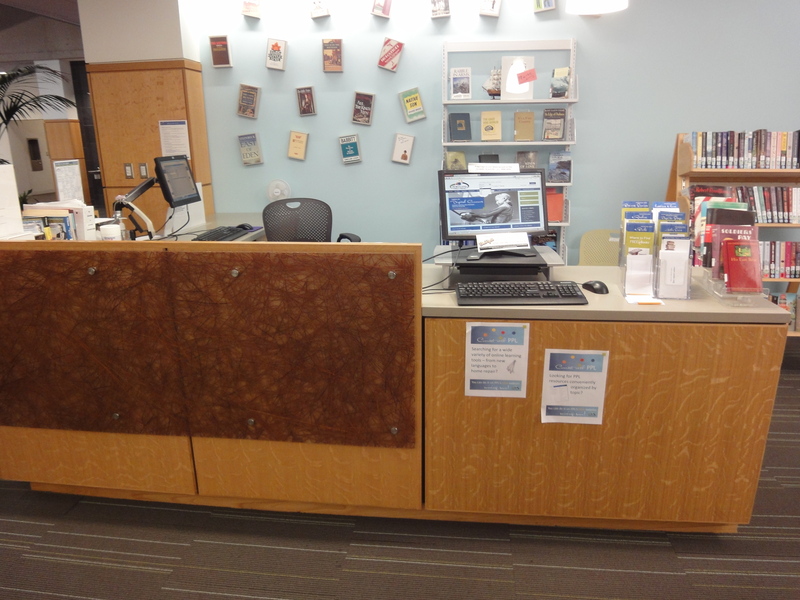 How, then, can librarians improve information literacy instruction? Talking to faculty is the most important step, Saunders said. Anticipate the needs of the faculty, know their concerns, talk to them about what they’re interested in, target your message to their discipline. Students must realize that finding information is only the first step, and just because something is peer-reviewed does not mean it’s 100% reliable; evaluation (“thinking”) is still necessary. Robbins Library was well represented on Monday, with two of our librarians presenting on panels during the day. Though the panels themselves were on different topics, both librarians talked about book groups they had started at the library. Linda Dyndiuk started off the “Not Your Average Book Group” session at 10:45 by talking about the “Not So Young Adult” (NSYA) book group she started in February 2012. 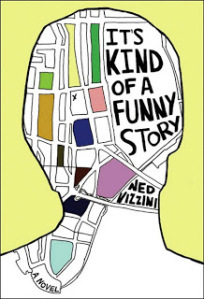 As the name suggests, this is a group for adults who like to read young adult literature. Though it has thus far attracted mostly women, the age range is dramatic (30s-70s). The group has been successful, with 20+ people on the mailing list and a core group of attendees; a reporter from the Arlington Advocate interviewed Linda for a story (“Arlington adults share love of young adult literature“). Other presenters included Theresa Maturevitch from Bedford (MA) Free Public Library, who runs a cookbook book club complete with cooking demonstrations; Sophie Smith, from Nashua (NH) Public Library, who runs an adult summer reading program; and Sean Thibodeau from Pollard (MA) Memorial Library, who leads a nonfiction book group. You can read Theresa’s notes on the whole session from the first link above. 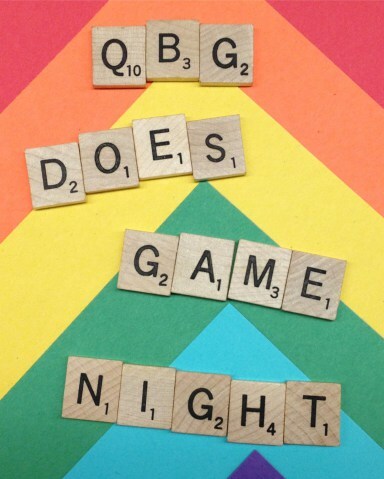 Rebecca also talked about the difficulty of finding books by and about the LGBTQIQ community (and about the difficulty of the acronym, which is why she chose “QBG” for her group). She encouraged librarians involved in collection development to order these books and make sure they are on the shelves. Good resources for books include Lambda Literary, and for books, movies, and TV shows, Towleroad, Autostraddle, and AfterEllen. During the same outreach panel, Lydia Willoughby from Vermont Technical College talked about her work with the Vermont Queer Archives, and Amber Billey from the University of Vermont talked about outreach through dance parties in Brooklyn, San Francisco, and Chicago (see links below). The Desk Set: “A Hipper Crowd of Shushers,” The New York Times, July 8, 2007. 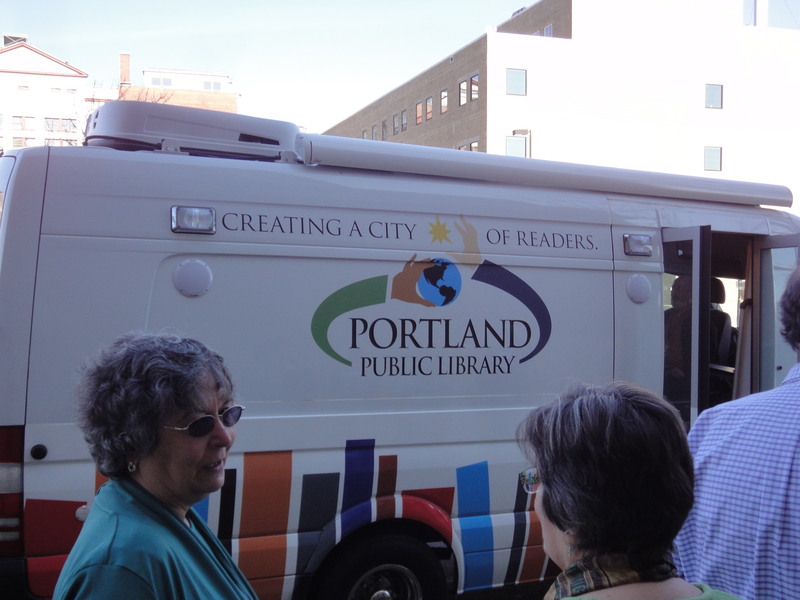 Monday morning the Portland Public Library Bookmobile came by the conference center for a visit. 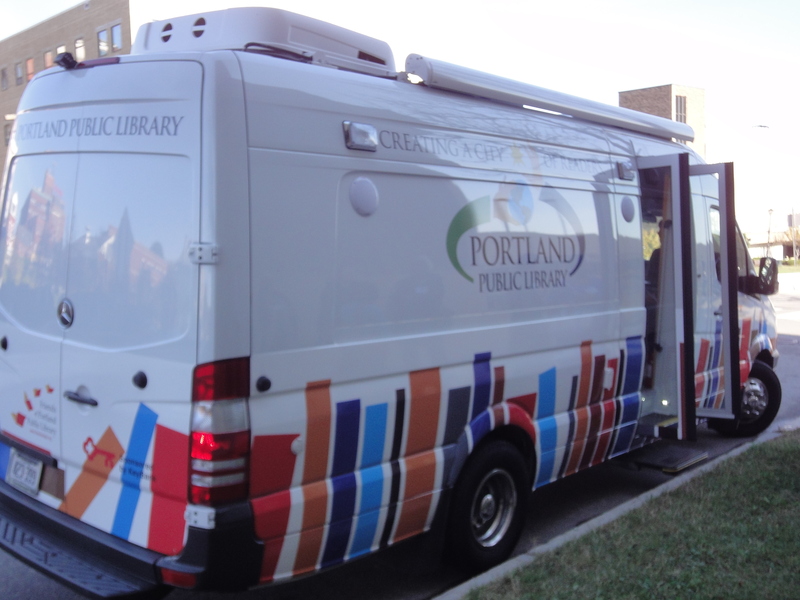 It’s on the small side (compared to the only other one I’ve ever been in, the Worcester Public Library Bookmobile), but wonderful all the same. The bookmobile had children’s, teen, and adult material, including books, graphic novels, DVDs, audiobooks, and large print books. Monday evening I visited the main library, which is beautiful. 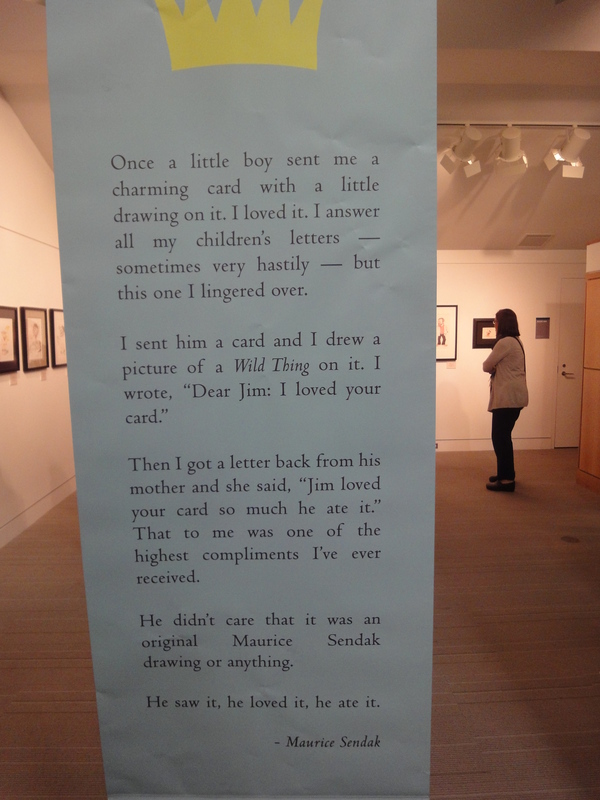 It is also currently hosting an incredible exhibit of Maurice Sendak’s work (though it looks like this will be coming down in a few days). The exhibit included a copy of the Imagination/Celebration poster, as well as many illustrations for fans, and quotes from fans (some of whom are/were famous themselves). Most of my two days in Portland were spent in the hotel conference center, but what I saw of the city was really great. Speaking of which – I almost forgot – Sunday night there was a party at LibraryThing HQ, and while everyone else was by the food table, I was marveling at all the books. 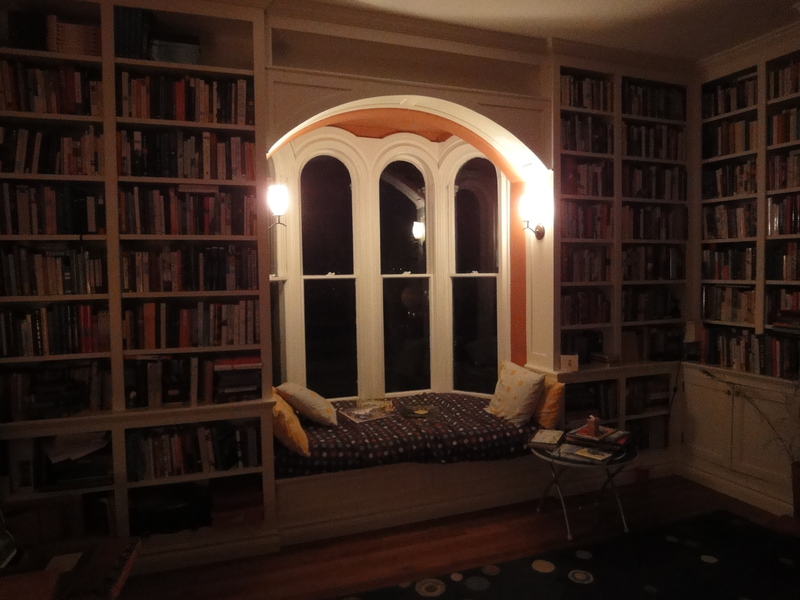 The photo’s a little dark, but there are built-in bookshelves on three walls, plus a window seat and a fireplace. 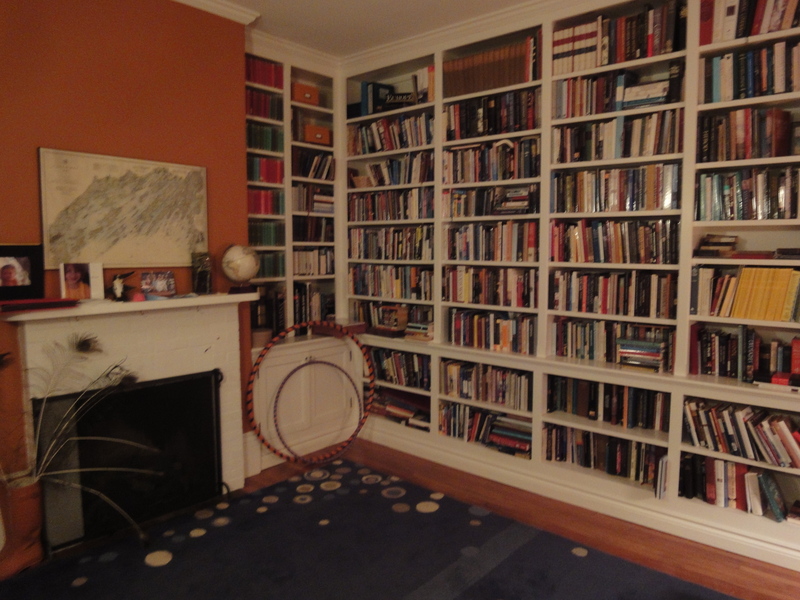 Basically, every librarian’s dream room. 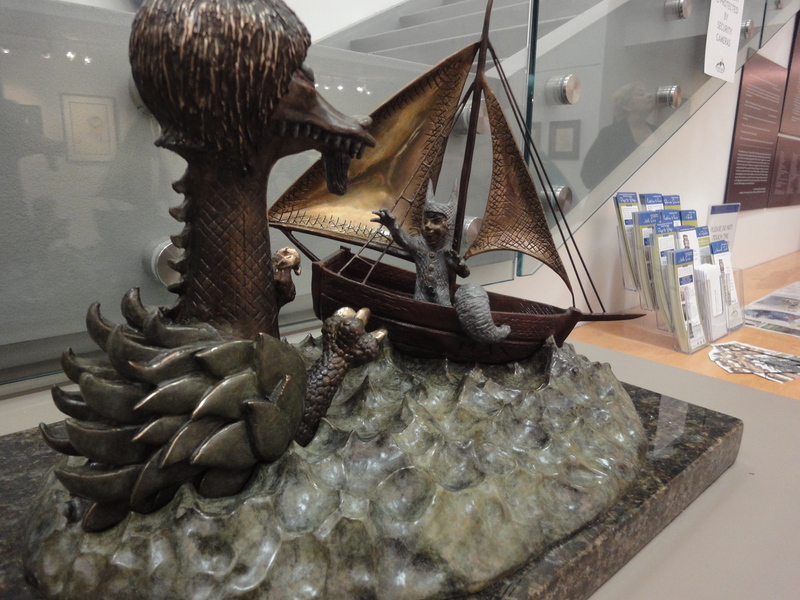 I’m back from the New England Library Association annual conference in Portland, and it was great. I was on Twitter (@itsokihaveabook) Sunday afternoon and all day Monday, madly tweeting and re-tweeting with fellow conference-goers; the conference continues today, and you can follow it on Twitter with the hashtag #nelaconf13. The NELA Conference blog is also a great resource. I just wrote a post there about the Table Talk I attended Sunday afternoon, Engaging the Community in Long-Range Planning. I highly recommend Brian Herzog’s (a.k.a. Swiss Army Librarian) post about The Art of the E-Book Deal, which was earlier Sunday afternoon; Jo Budler, the Kansas State Librarian, was energetic, inspiring, fierce, and funny, and Brian summarizes her presentation well. There are also links to notes and slides. Working backward…the keynote event with Rich Harwood of The Harwood Institute kicked off the conference on Sunday at 1pm. His message – “Libraries are needed more now than any other time….Healthy communities need healthy libraries” – was received well, though overall his presentation was less electrifying (and less specific) than I’d hoped. The fact that we aren’t supposed to focus on the problems doesn’t mean there aren’t any, just that we shouldn’t get bogged down in them. 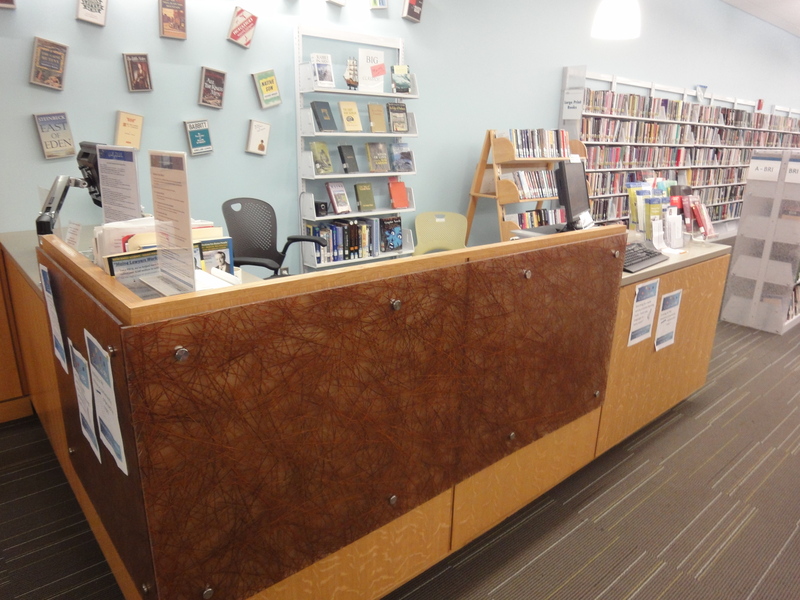 No one individual or organization can solve all of the issues in a community, but the library should be an important partner, working together with other organizations and individuals to set achievable goals (and celebrate victories). “Narratives play a critical role,” Harwood said. Libraries can help move away from an ingrained negative narrative and create a shared positive narrative instead – after all, storytelling is a big part of what we do well. I don’t think anyone’s arguing with Harwood’s message; most of us agree about the “what,” it’s the “how” that can be puzzling at times. The keynote speech was a good reminder to keep trying, and that it’s okay to start small. For those who do not know, The Time Traveler’s Wife is my favorite book. This is not hyperbole. I first read it approximately nine years ago, and I’ve never really stopped reading it. We have at least four print copies in the house: two U.S. editions, a limited edition with a cover by the author, and a U.K. edition (purchased during a semester abroad in Spain; I lasted about two months without a copy, then went to London and bought a new one at Paddington Station. First agenda item, before museums or anything). But back to “Alba, Continued.” This is very much like, if you happen to be a Narnia fan, someone casually opening the door to the wardrobe and inviting you to step on in. Or if you are a Harry Potter fan, receiving a letter from Hogwarts (never mind that you aren’t eleven years old anymore). Or if you are a Philip Pullman fan, and you come across a window into Lyra’s Oxford. If all three of those things happened to me simultaneously, I could not be more excited. “I wasn’t planning to write a sequel so this is still new to me. 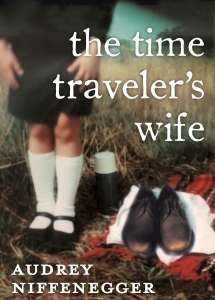 Joe Regal of Zola Books asked me if I had any Time Traveler’s Wife material that hadn’t been published; he was looking for something to publish with the e-book of TTW as an extra. I had nothing that would have made any sense to a reader, just notes and revisions. So I promised to write something new. And so the wardrobe, when you least expect it, opens.